As we’ve said before, our Manitoba winters are long! We’ve created a list of outdoor fun, but sometimes even the toughest of us need a break from the cold. In recognition of that fact, we’re providing a list of more places to play – this time indoors. West Portage – 3550 Portage Avenue, Elmwood Kildonan – 454 Kimberly Avenue, South – 5 Fermor Avenue. Three of the Y’s four branches in Winnipeg have indoor playgrounds. Drop in fees for non-members are $7 for one kid (respite workers get in free), or $20 for a family. The Y will show up in other catergories on this list, meaning it’s possible to stretch that money for a few different activities in one visit. 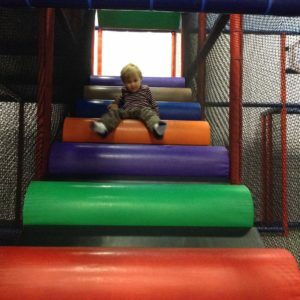 Kid City includes a 3 story indoor playground, an inflatable bouncy castle, air hockey, a laser maze, and a special area for toddlers. There’s also a restaurant so lunch can become part of the plan. Kid city can be busy at times, so for kids with sensory difficulties, going at non-peak times may be recommended. Cost is just over $13 per child over 3, and $10.45 for younger kids, while 2 adults get in free for every child. Available for kids 12 and younger, Great Big Adventure includes a large play structure (with seven 20 foot slides), a toddler section, and a large area to play mini stick hockey. Children four years old and up get in for 11.95, or for 9.25 if you come after 5 pm from Monday to Thursday. The Manitoba Museum is divided into three areas. The museum exhibits walks you through Canadian history, including fossils, a life-size replica of a ship called the Nonsuch, and an opportunity to enjoy old silent films. The science gallery is designed to be as interactive as possible, allow kids to explore the area most interesting to them. The planetarium involves various shows that provide education about our solar system. Admission to the museum is pricier than some of our other listed options – kids get into one area for 7.50 while adults cost 11.00. Doing multiple areas in one day saves some of the cost, but depending on your child’s tolerance, may be a bit much to fit in. Manitoba’s Electrical Museum tells the story of hydroelectric development in Manitoba, educates about safe electrical use and about how electricity works. Admission to the Museum is $3.00 per person, children 5 and under free. Hours are Tuesday to Saturday, 1:00pm to 4:00pm. If you have a child that’s into planes, then this is the place for you. Planes include bush planes, historical passenger planes, and historical cargo planes, as well as aircraft that are currently being restored. Children aged 3-12 get in for $3.00 apiece, while adults cost $7.50. This museum is small, but full of fascinating history for fans of trains. Located in the historic Winnipeg Union it includes old locomotives, rolling stock, and maintenance equipment, and tells the story of key parts of Winnipeg’s history. The museum is closed Wednesdays and Fridays, but open during the day for the rest of the week. Adults get in for $5.00, while children 6-15 cost $3.00. There are 13 City of Winnipeg pools. That’s too many to describe in detail, but the link we’ve provided gives a quick overview of the amenities at each of them. A few that we think stand out? Pan Am, for it’s zero entry wading depth pool, Boni-Vital, for its large shallow pool that give lots of room for kids 10 and under to play, along with a deeper pool for older kids, and Concordia, for its multiple pool set up and waterslide (for a small extra cost). If you take a look at each pool’s schedule, you’ll likely be able to find a toonie swim, helping keep costs down. Y pools tend to have somewhat more open free swim hours for kids. All three locations have waterslides, a pool shallow enough for young kids, but deep enough for older kids, and a hot tub. Admission is still $7.00 for a child, but as mentioned, it might work well for you to pair it with other activities. Hosted in Van Wallegham School mini-gym, Lindenwoods Play Group meets every Thursday during the school year from 6 to 8 pm. Drop in anytime, kids of all ages welcome. There are balance beams, rock climbing wall, lots of mats to jump on, parachute, and other gym equipment. Parents are required to stay with their kids. Admission is free! Yes, the Y is making it onto this list for the third time. All three locations of the Y have a wide range of drop in programs for kids, including unstructured gym time, more structured sports, board games, and arts and crafts. Admission costs are as listed above. Although many of the above listed options may be suitable for your kids, it’s worth giving special mention to the organizations that put the effort into creating sensory friendly options for those on the autistic spectrum. About once monthly, Skyzone turns down the light and music to make their indoor trampoline experience even more enjoyable for kids with sensory sensitivities. Skyzone includes several free trampolines, trampoline dodgeball, trampoline basketball nets, trampoline volleyball and a sponge pit that jumpers can take turns jumping into. The scheduling on this has changed from when Skyzone originally started the practice, so it’s worth calling to make sure you get the right note. Admission is $12 for two hours of jumping. Cineplex screens movies in a “sensory-friendly’ setting roughly every 4-6 weeks. Movies are screened at 10:30 on Saturdays, with tickets available to the show the previous Tuesday. Sensory-friendly in this case means lowered sound, and more lights remaining on. It’s also not unusual for viewers to be a little more active than is typically considered acceptable in theaters. We hope this list helps you find some enjoyable indoor activities that are the right fit for your kids, and for your family as a whole. Did we miss something? Point you to a good experience? Either way, please let us know in the comments below! “Not in Winnipeg, but we enjoy going to the Steinbach Aquatic Centre in the cooler months. I have yet to make it to Portage La Prairie but the facilities are similar.